On Friday, September 7th, 2018, at approximately 10:40 P.M., Morgan Hill Police Officers were dispatched to the area of Tennant Ave. and Church St. , to investigate the report of a person stabbed. Upon arrival, Officers located the scene near Tennant Avenue and Church Street, however, they were unable to locate a victim or witnesses. Several minutes later, Morgan Hill Police Communications received a phone call from a local hospital who advised a 16 year old stabbing victim had been dropped off and was receiving medical attention. Officers learned the victim sustained multiple stab wounds to his back and was in critical condition. The investigation led officers to develop information which led to suspect and vehicle information. Saturday, September 8th, at approximately 7:16 P.M., a Morgan Hill Police Officer on proactive patrol, recognized the suspect vehicle and conducted an enforcement stop. The 17 yr old male juvenile driver of the vehicle was positively identified as being involved in the altercation/stabbing. 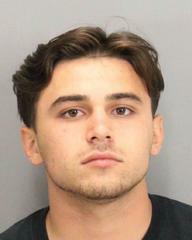 The investigation led to the identity of another involved subject, Roman Yerkovich, 19, of Morgan Hill, he later turned himself in at the Morgan Hill Police Department. Morgan Hill Police Detectives developed additional information and the identity of yet another involved subject. 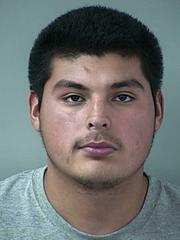 Luis Pineda, 19 of Morgan Hill was arrested at his home this afternoon. He was later booked into the Santa Clara County Main Jail. Anyone with information regarding this case can contact Detective Fernando Del Moral at (408) 779-2101 or the anonymous tip line 408.947-STOP (7867).